From the Gangetic plains to the Karakoram Heights is volume I of Maidu1-Haq’s memoirs, Unknown, Unhonoured and Unsung. It recounts his early schooling at Delhi, his engineering studies at the Bengal College of Engineering, Shibpur, his military training at the Indian Military Academy, his experiences during his various postings as a soldier in the Pakistan Army. With his engineering expertise, he is sent to the Karakoram Heights, where China and pakistan were to build a highway.On a personal note, the volume recounts the writer’s relationship with his father, the career choice he had to make after the early death of his father, and the dramatic events surrounding his marriage. 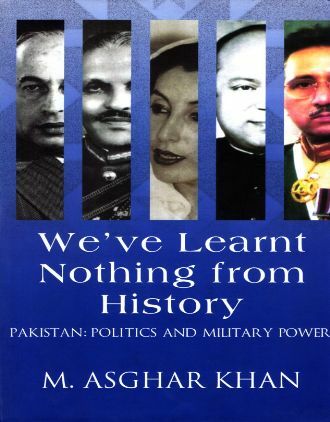 Momentous events take place in his formative years: the Quit India Movement, the Partition, the creation of India and Pakistan, the declaration of martial law by General Ayub Khan. He is affected by these events but refrains from going into a political or historical discourse. 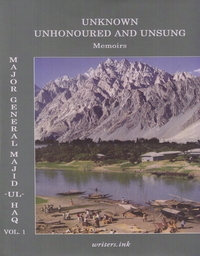 instead, the book attempts to tell the writer’s experiences as they were like when they happened.The writer’s graphic eye and skill as storyteller are seen when he describes the political personalities who played a significant role in the Pakistan movement or the military personnel he happened to become acquainted with during his military career. 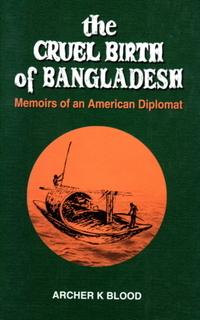 However the volume also provides humorous anecdotes as well as detailed descriptions of scenes and people who left an imprint on the writer’s mind.From the Gangetic Plains to the Karakoram Heights provides a valuable account of the life of a Bengali engineer in the Pakistan Army when East and West Pakistan were two wings of the same country. It is essential reading both for the social and military historian, but narrated lucidly enough for the common reader to enjoy.